The normal disc printers available in the market are becoming more and more popular as it works like normal printer, and can print up to any number as you wish.The design is print directly onto the disc itself, and the quality look as good as the mass produced discs in the market. 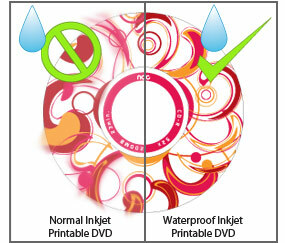 Ndc has offer a new water-resistant DVD discs which will not smudge when comes in contact with water. This technology is known as Water-shield/water-proof. 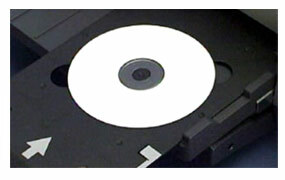 The great thing is that it can be used in any inkjet CD DVD printer and work just like the normal disc. 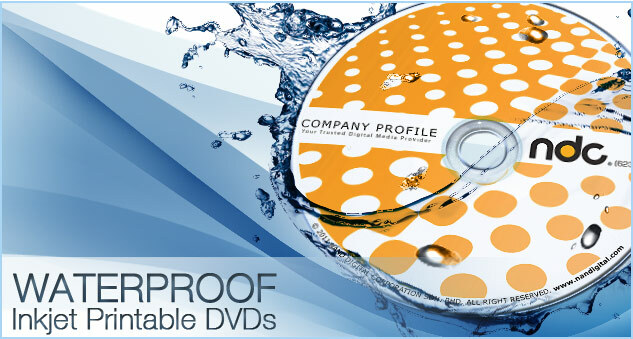 It has a specialised printing surface which makes the ink dry quickly and locks into place, stopping it from smearing and smudging.Other than the advantage of being water-resistant, this DVDs have a high quality of glossy finishing to them which is one of the biggest seling point of the products. 1. DVDs resistant to water. 2. Its surface feels like the high-gloss photopaper. 4. Excellent priting and color fidelity with high saturation. even if it is printed with non-waterproof dye ink.